50 Bobby McIlvaine Palm Cards! Between now and December 31st, we at AE911Truth are holding a year-end fund drive to fill our small 2017 funding gap and start 2018 on a strong footing. The goal of this drive is twofold: Bring in $25,000 over the next 12 days and distribute 50,000 palm cards as gifts that supporters can use to raise awareness of the Bobby McIlvaine Act. You can be a part of this effort by making a donation of $25 or more ($30 for non-U.S. residents). As a token of our gratitude, we will send you 50 Bobby McIlvaine palm cards to hand out in your community. Once we reach 1,000 donors, we’ll have put 50,000 palm cards in the mail to be handed out in the coming weeks and months! 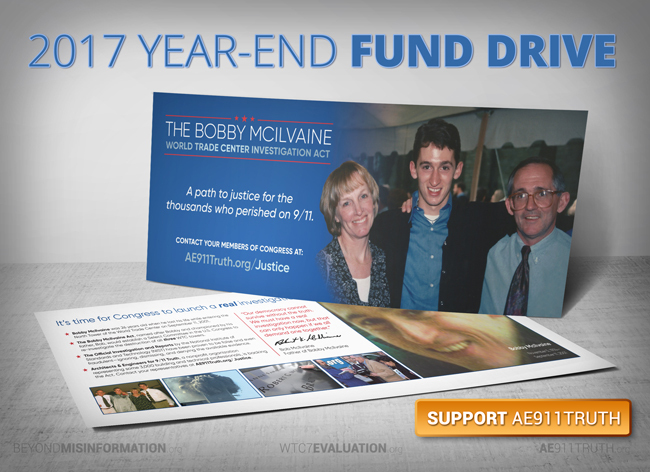 Will you please make a year-end donation to power AE911Truth forward and build support for the Bobby McIlvaine Act? If you’re not in a position to give $25, we understand. Whatever amount you can chip in will help us reach the goal. Plus, anyone can join the grassroots outreach effort by printing Bobby McIlvaine palm cards at home using this PDF. Meanwhile, on the social media front, we’ve made incredible progress over the past two days in bringing more exposure to the Bobby McIlvaine Act. 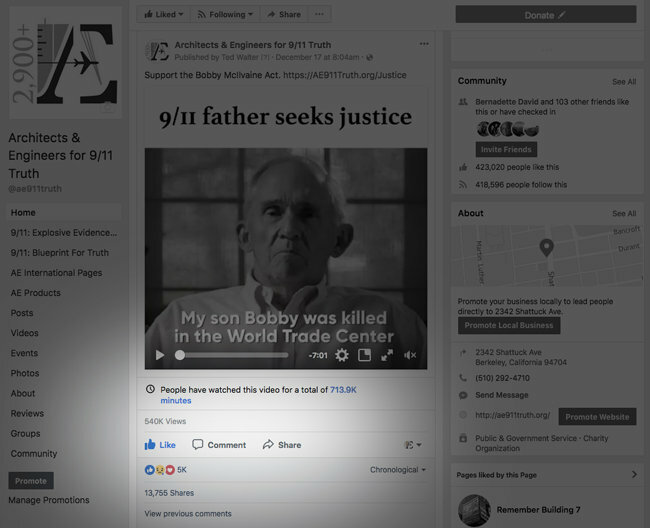 Within 36 hours of releasing the video 9/11 Father Seeks Justice on Sunday morning, it had surpassed a whopping 500,000 views on Facebook, informing hundreds of thousands of people about the Act. If you haven’t seen the video yet, we invite you to watch it now and share both on Facebook and YouTube. Thanks to those of you who donated toward the Facebook ad of the video, the $500 contributed thus far will enable us to reach as many as 300,000 additional Facebook users in the days to come! Once the video reaches one million views, which shouldn’t be too long from now, we’ll start an email advocacy campaign, encouraging you to send the video to your members of Congress. So stay tuned for that!